Nip Wijewickrema founded GG’s flowers to provide employment for her sister Gayana. Photo: Supplied. A pair of cheeky, cheerful socks can be a great way to express your personality and show off your lighter side. Tomorrow (March 21) is International Down Syndrome Day and people everywhere are being encouraged to break out the crazy socks and celebrate the richness, diversity and strength of the global Down Syndrome community, perhaps even by donning three socks to symbolise three chromosomes. Here in Canberra, a group of local businesses – including Mollycoddle Parties, who will be providing face painting and balloon twisting – will hold a morning tea for sponsors and friends at the Fisher Shops between 10 am and 1 pm. The morning tea is organised by Raffy and Charlie from Car Mechanical Services who is a fulltime carer herself for an adult family member with Down Syndrome and has invested a huge amount of time, money and energy in the fundraiser. All proceeds will assist the ACT Down Syndrome Association’s work with people who live with Down Syndrome in Canberra and their families. 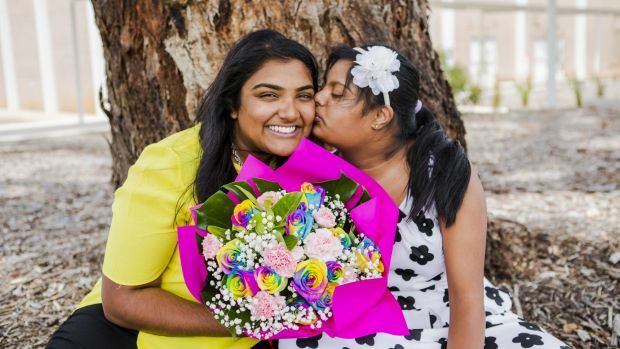 Local businesswoman Nip Wijewickrema started her business GG’s flowers seven years ago to provide employment for her sister Gayana, who lives with Down Syndrome. She says that when they started the business, there was much less awareness of the potential people with Down Syndrome have for full, rich lives. “Now you see much more employment and willingness to engage. People with Down Syndrome are loyal devoted workers, and they are screaming for a fair go. I think society now is becoming much more progressive and inclusive, and celebrating World Down Syndrome day is about shining a light on what they can achieve if provided with a bit of support, love and compassion. GG’s pays award wages to all their employees living with a disability and Nip says it’s wonderful to see her workers lead independent and fulfilling lives. “To see them fly is an incredible honour,” she says. Her sentiments are shared by Nip’s good friend Jodi Shepherd of HotShots photography, who has also worked extensively professionally photographing people in the disability community. “Some of my close friends are carers of people with Down Syndrome and I see their daily struggles and triumphs to keep everyone busy and involved,” she says. 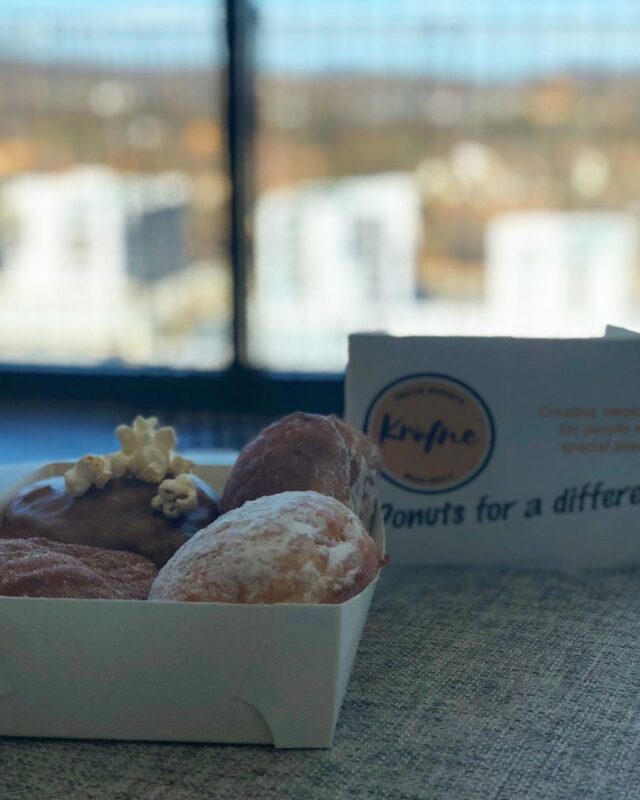 She also celebrates Danijela Vrkic’s Krofne “doughnuts with a difference”, created to help support Danijela’s son Anthony who has Down syndrome. Wearing crazy socks and uploading a photo of them on social media, buying some doughnuts or finding a way to employ or support people with Down Syndrome to lead a full life are all ways to start conversations about the lived reality of Down Syndrome and how to create a world where each person living with the syndrome can reach their full potential. The estimated incidence of Down Syndrome is between 1 in 1,000 to 1 in 1,100 live births worldwide. Down Syndrome Australia says that around 13,00 Australians and their families are affected by the syndrome. World Down Syndrome Day has been officially observed by the United Nations since 2012. This year’s theme for the day is “Leave No One Behind”, taken from the 2030 UN Agenda for Sustainable Development and on March 21, members of the Down syndrome community will be at the United Nations in both Geneva and New York to speak to key stakeholders in Education and Employment and to focus on ensuring all people with Down syndrome should have opportunities to live fulfilling lives and to be included on a full and equal basis with others across all aspects of society. Mark Global Down Syndrome Day and help raise funds for the ACT Down Syndrome Association at the Fisher Square shops at Kalgoorlie St., Fisher between 10 am and 1 pm tomorrow. Thank you to the incredible Raffy Sgroi at Car Mechanical Services Fisher for having us!!! We can’t wait to support ACT Down Syndrome Association.